Kitchen and bath trends are no longer about keeping up with the “Joneses”, but rather setting styles apart from your neighbors. Homeowners are seeking more unique, individual designs with efforts on personalization to better suit their individual needs. •	Bamboo - This eco-friendly option is becoming more and more popular mostly due to the growing numbers of styles and colors it’s available in. 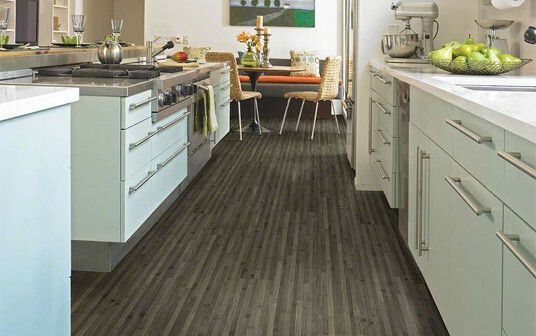 Bamboo is durable, can look just as good as hardwood and is typically priced less. This type of flooring works best in a modern room where a sleek look is desired. Kitchens are more suitable rooms for bamboo as opposed to bathrooms where there is an excess of moisture. •	Reclaimed wood - Reclaimed lumber has been salvaged from old homes, barns, mills, and other industrial buildings as they’re being taken apart. Its beauty and quality transformed by the natural aging process is second to none. But if you’re not willing to pay the price for this little piece of history, have no fear, factory-finished hardwood flooring can look just as authentic as reclaimed timber without the high cost. •	Oversized Tile - Rather than using a 12” x 12” tile, we are seeing 12” x 24” and even tiles as large as 36” x 36” for a clean look that requires less maintenance than a regular tile due to less grout lines. •	Concrete - This sleek, ultra-durable and trendy material can work with a variety of decors mostly because there are endless color and texture options. When installing concrete, make sure it is properly sealed on both top and bottom surfaces to prevent water from seeping in and causing mold or mildew. •	Luxury Vinyl Tile (LVT) - combines the high-end look of hardwood or stone with the durability of vinyl, for a floor that looks great and also stands up to moisture. People are drawn to this material for its comfort, style and lower price-point than hardwood or stone. •	Shaker Style - These simple, clean cabinets have been around for centuries and have had a major comeback in the past few years. 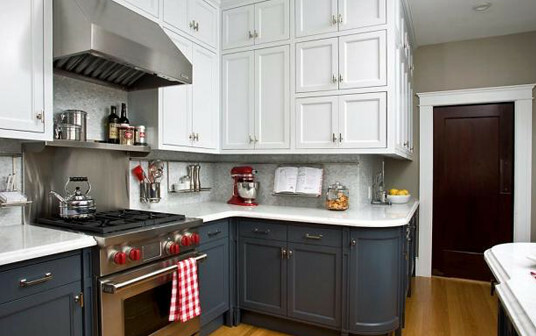 We typically see these cabinets in white with a recessed center but virtually any material and color can be used including painted, thermofoil (vinyl wrap) and burnished finishes. •	Glass Front Cabinetry - Although this isn’t a new trend, its been around a while for a reason. Glass cabinets can make a kitchen feel larger as well as break up the top cabinets from the bottom cabinets to add some interest to your space. The obvious drawback is that you have to keep your cabinets neat and orderly at all times. You may even need to purchase new dishes, glasses, etc to be shown off but who doesn’t want an excuse to go shopping! •	Two-Toned - This fun look has been popping up everywhere and although it creates more decisions, the simple rule is to keep either the top or bottom cabinets neutral and juxtapose them against a pop of color or a darker hue. •	Horizontal Orientation - Not only does this trend provide extra space by adding more drawers and cabinets, it majorly updates any kitchen or bathroom. If you have a lot of clutter, especially in a bathroom, these cabinets offer more organization options to hide your toiletries. 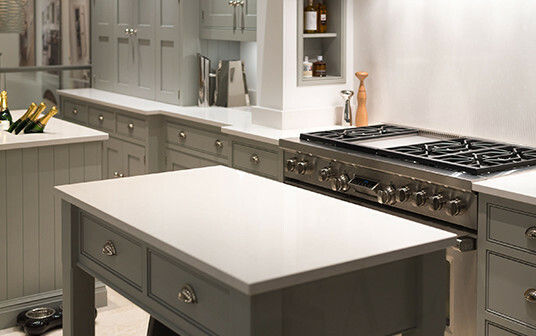 •	Solid Surface - These countertops are great because they are easily to maintain, they are non-porous so they don’t need sealant and most importantly they are ultra-durable. They come in a variety of colors and work with most if not all decor. One drawback is that unlike granite, you cannot put hot pans or hot styling tools on them or you risk damaging the surface. •	Concrete - Although these countertops need to be sealed regularly, their modern look and endless finish options makes this material a hot item in the kitchen and bath design world. They are resistant to high heat and stains and when a seam filer is used, there aren’t any visible seams. The price for concrete is on the high end but not quite as expensive as granite, quartz and marble. •	Engineered Stone - This material is comprised of 93% quartz particles with a much lower price point. Engineered stone offers resistance to heat, stains, bacteria and scratches and they are also easy to maintain. •	Granite - Most new construction and countertop upgrades are done using granite countertops because of their durability, heat-resistance, beauty and ability to bring up the value of your home. Granite has been hot for several years now and it is most likely going to stay that way for some time. 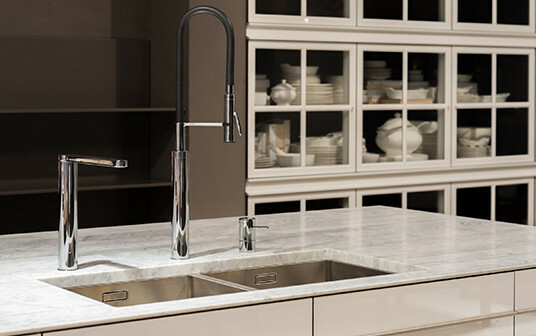 Modern appliances are all about function, design and most importantly technology. 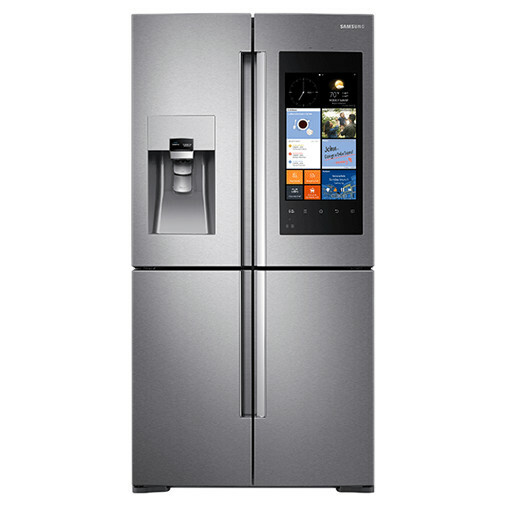 From the Samsung refrigerator with an entire interactive front panel to induction cooktops, there is no shortage of innovative options to consider when purchasing new appliances. Stainless steel still seems to be on top of the finish trends but if you’re daring and want to add some personality to your kitchen, there are a number of appliances available in bright, bold colors. White appliances are also making a comeback for those who are using white as their main color in the rest of the kitchen for a clean, minimalistic look. Even though black may seem like an outdated color, manufacturers are updating the look by creating black stainless steel. Some other trends in appliances we’re seeing are freezer on bottom refrigerators -which are quickly replacing the side by side options, wine refrigerators, steam ovens and even putting multiple of the same item in your kitchen, for example two dishwashers. And finally smart appliances are quickly gaining popularity, from ovens that text you when your meal is ready to refrigerators that can monitor the freshness of your food, it’s no wonder. •	Freestanding bathtubs - We’re seeing a trend of people abandoning bathtubs altogether in lieu of showers but for those who can’t give theirs up, freestanding soaking tubs are all the rage. 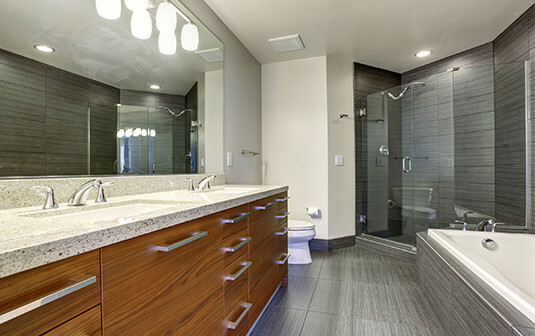 They offer flexibility in where they are placed in the bathroom and are a great focal point for the room. •	Shower seats - We wonder why this hasn’t been bigger, much sooner considering most of us shower in the morning when we are still trying to wake up! Who doesn’t want a spa-like experience to start their day off right? •	Steam showers - Another relaxing spa feature and centuries-old tradition is a steam shower, and many people are splurging on this trend to help improve their circulation, recover from exercise and give themselves a well-deserved skin treatment. •	Infinity baths - An infinity bath offers users a relaxing experience with continuous water flow for a truly calming effect. Not to mention how gorgeous one of these will look in your new bathroom. 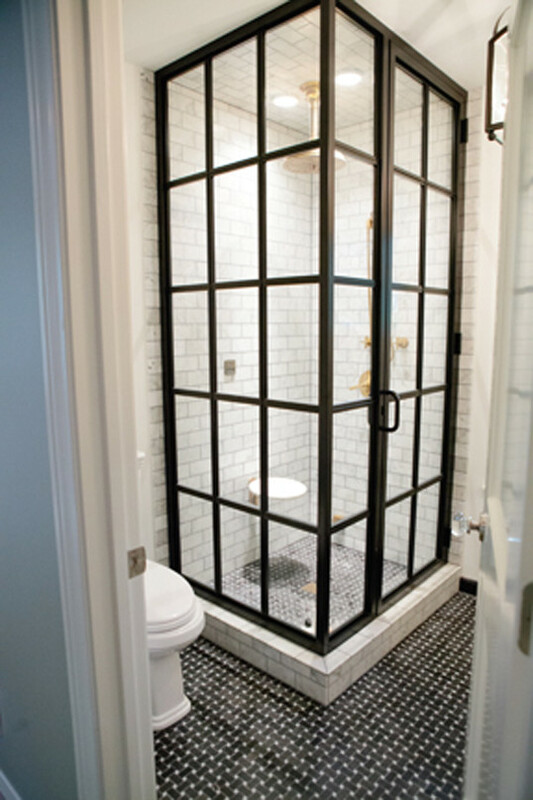 •	Salvaged shower doors - Glass shower partitions are huge right now and can really open up your bathroom, which is typically one of the smallest rooms in the home. We’re seeing salvaged doors and windows being used to create a modern, industrial look that is definitely swoon-worthy. •	Roman showers - Roman showers are a perfect marriage of form and function. The open shower looks updated and lavish, while the lack of a rim to step over makes it easier for people to get in and out, especially those who are limited in their mobility. Don’t worry about water leaking out allover the bathroom floor, the floor slopes down into the drain. 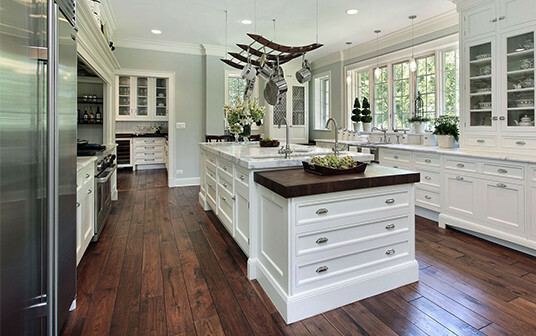 • Gray - While white has been the top dog for some time, gray is breaking through and projected to be the next white in kitchen colors. Pairing a light gray with a rich wood is a gorgeous combination and we think we’re going to be seeing a lot of this. •	Black and White - Piggybacking on the farmhouse trend, this classic Americana look is popping up everywhere. Even if your decor doesn’t have a rustic or country feel, these colors can fit in with almost any style home, including modern ones. However, keeping the floors a nice hardwood will ensure the stark contrast of the black and white remains inviting. •	Pops of color - Just because your kitchen cabinets and countertops are a muted color doesn’t mean you have to settle for a bland look. Adding pops of color can really bring out the beauty of your kitchen and make people think you had a professional decorate your home. When we say pops of color we don’t mean bright, bold hues but rather rich colors like deep reds, muted yellows and calming sage greens.